When Reverend Thomas Kendall arrived on the South Coast in 1828 in search of red cedar, he settled on some land just north of present-day Milton, near what is now Narrawallee. As it became evident that this was where better soil (the famed Milton monzonite) could support farming, more families were attracted to the area. Gradually, this small village centre became known simply as ‘The Settlement’ and the harbour from where supplies arrived and produce was shipped to Sydney was called ‘Boat Harbour’, which became the present-day town of Ulladulla. Milton was first developed as a private town in 1859, with all the land owned by John Booth, an investor, speculator and excellent networker. 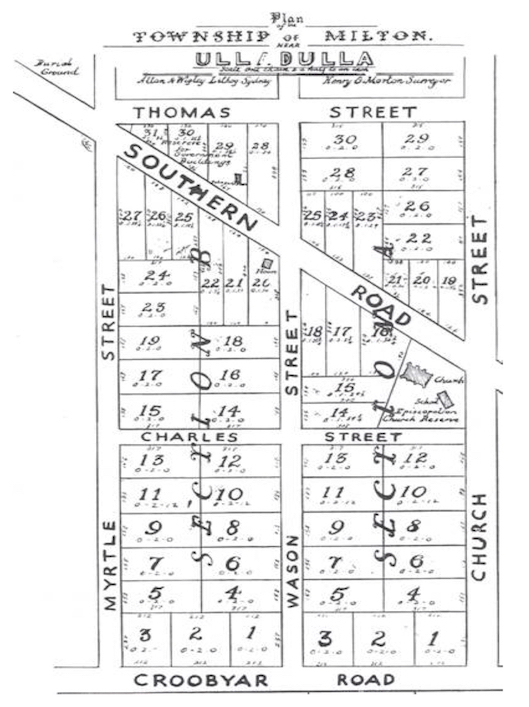 The town’s streets were surveyed by Henry G. Morton and the land divided into 62 allotments. Streets were named for Booth’s relatives and friends, such as Thomas St and Charles St for his sons, and Wason St for his friend William Wason. Lots were auctioned in February 1860 and sold for between £8 and £27/10/-. 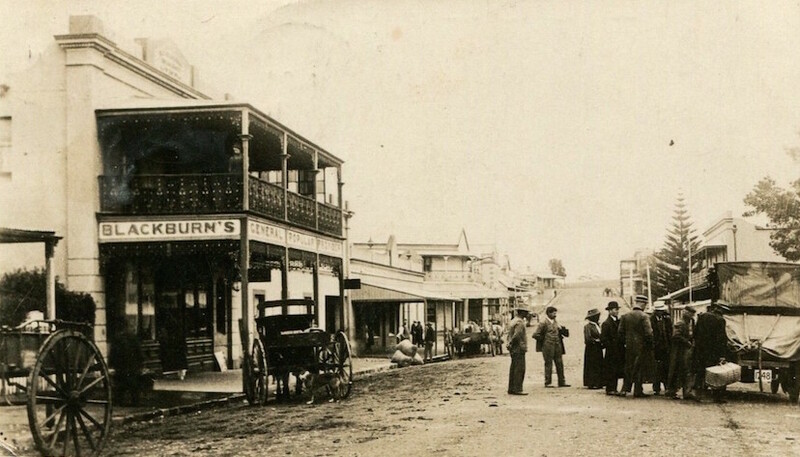 Although Boat Harbour/Ulladulla was a busy port, Milton with its strategic position on the main road became the commercial, banking and administrative centre and the place where visitors to the district would stay, in inns and boarding houses. The name of Milton has several possible origins – it was the name of Booth’s cousin’s estate in Bedfordshire; others attribute the naming to the town’s first post master, George Knight. Another story suggests it came from Booth happening to see a copy of ‘Paradise Lost’ by the 17th century English poet John Milton when he was searching for a suitable name. 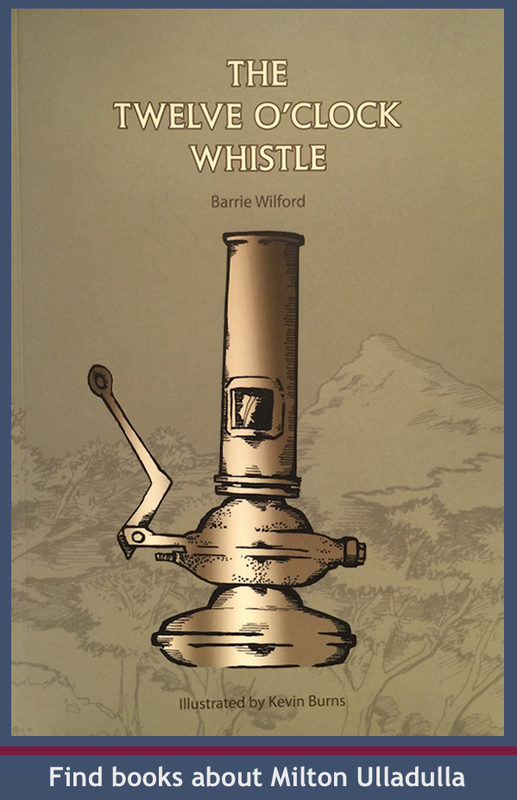 The name ‘Nulla Dollo’, or ‘Nulladolla’ or ‘Wollahderrah’ (used by Surveyor Florance in 1828) as it was variously spelled has several possible derivations but is most likely an attempt to transcribe the local Aboriginal name into English. When European settlers first arrived in this area of the New South Wales South Coast, spreading out from settlements in the Southern Highlands, coastal roads were virtually non-existent south of Shoalhaven (Nowra) due to the large number of lakes, lagoons and estuaries that needed to be crossed. Supplies and exports all had to be shipped via ‘Boat Harbour’ as it became known. 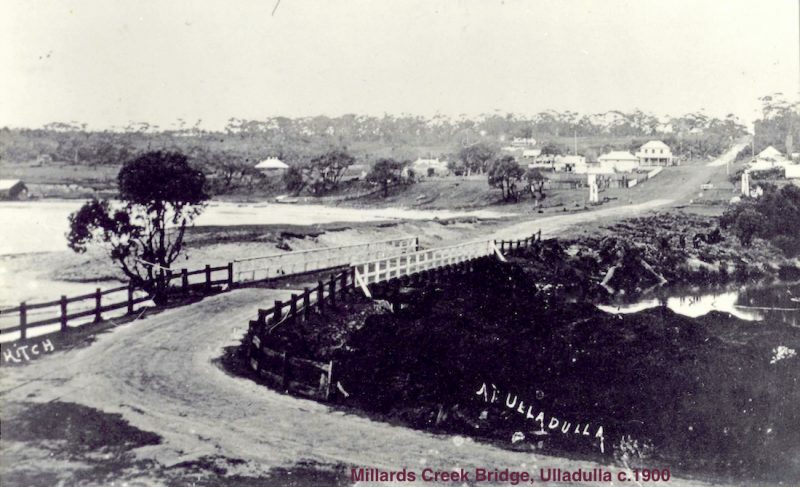 At that time, the name ‘Ulladulla’ did not mean the current town but was applied to the whole area between the coast and the mountains and from Conjola to Burrill. As the commercial centre around the harbour expanded with the shipping of farming produce and timber, the arrival of new settlers and the start of a ship-building industry, government services were established, with a Post Office in 1842. By 1856 The Settlement (Milton) and Boat Harbour had a combined population of about 400, and several stores and churches and a public house but no constable, magistrate or doctor. Boat Harbour, although a safe haven for coastal shipping (there are no shipwrecks around Ulladulla) lacked jetty facilities, with stores still being loaded via the beach. 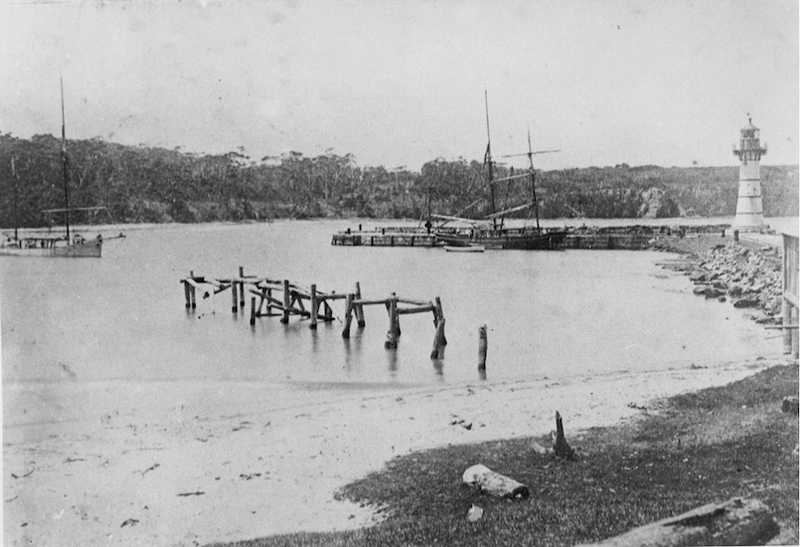 By March 1857, the Surveyor General had completed a survey of the Village Reserve of Ulladulla and in 1858 the harbour’s facilities improved with a timber jetty that was then replaced by a 75m long stone pier in 1865. Henry and Ellen Mitchell were granted a 640 acre land holding at ‘Molly Moke’ along Garside Road in 1859, perhaps named for a local sea bird, the black-browed mollymawk, a type of albatross. The Mitchells developed a prosperous dairy farm and large orchard. Sandridge Cemetery in Mollymook was established in 1893 as a new burial ground for the residents of Milton. At the turn of the century, as sea bathing became more popular, the Collers (of nearby Collers Beach) first allowed bathers across their land to access the beach. 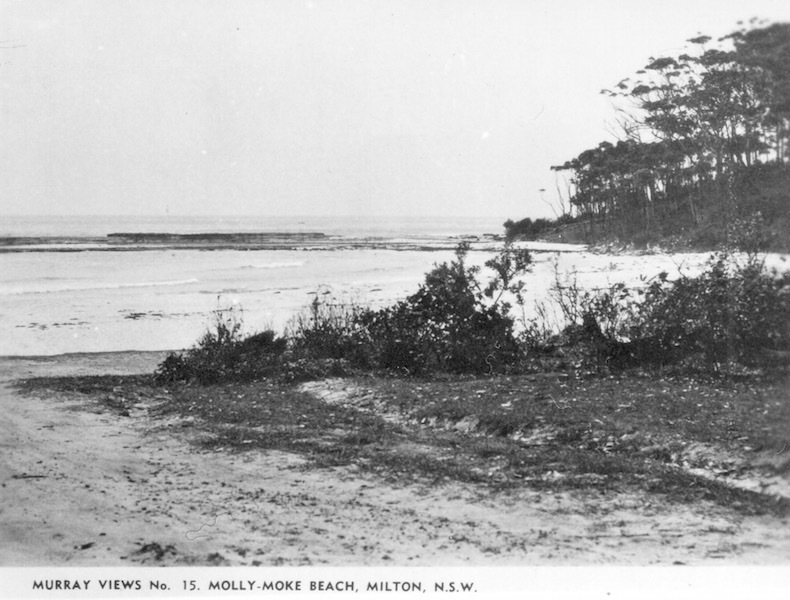 As Mollymook provided the nearest surf beach to Milton-Ulladulla, a public reserve was created in 1918 and, in 1922, the Milton Progress Association built bathing sheds. But Mollymook didn’t just develop through beach tourism as already by the 1920s it was also becoming known as a golfing destination, with a sand-green golf course laid out that overlooked both the beach and the sea. 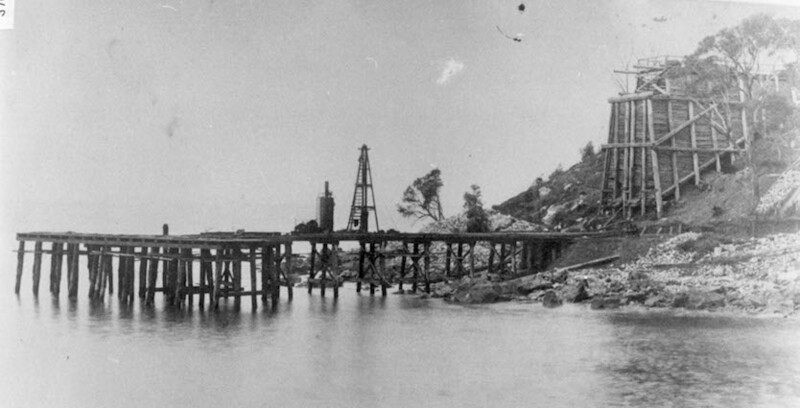 During the 1920s, silica was quarried at Pattimores Lagoon and transported via railway over a bridge over Narrawallee Inlet to a jetty at Bannisters Head for shipping. In the 1950s, Mitchell’s grandsons subdivided the old Molly Moke farm, beginning its development as a tourist haven popular with families, golfers and retirees. Although Mollymook remains mainly residential, its commercial centre continues to expand and now features several fine restaurants, clubs and bars.